The Beddington Farmlands Bird and Wildlife Report is produced annually by the Beddington Farm Bird Group (BFBG) and part-funded by Viridor. 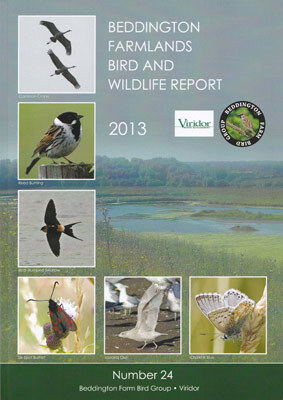 The report covers all bird and wildlife records for the year and includes a selection of colour photographs. It is free to BFBG members and can be purchased by non-members. The 2013 report is now available, and some back-issues are also in stock. Alfrey, P., Milne, B. & Coleman, D. (2010) The Birds of Beddington Farmlands. Surrey: BFBG. Described by Birdwatch magazine as an ‘urban birding benchmark’, The Birds of Beddington Farmlands is the first work to cover the rich bird life of the site. The 184 pages are a testament to countless hours spent spent by numerous naturalists and birders over many years recording birds and other wildlife found on the farmlands. 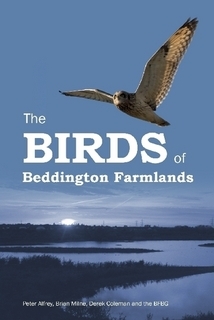 The book includes a comprehensive systematic list of an incredible 253 bird species recorded here up to the end of 2007, 113 colour photographs, 20 drawings , numerous maps and tables and a detailed account of the history of Beddington Farmlands, covering the pioneering ringing studies carried out in the 1950s and 60s. A must-have for any London birder as well as anyone interested in the natural history of south London’s area of green space.